Leonard Maltin called and asked if I would discuss the music in Disney’s original Zorro series (1957-59) starring Guy Williams. I jumped at the chance. I loved the series when I was growing up, and it was a great opportunity to talk about George Bruns’ famous title song (“Out of the night / when the full moon is bright / comes the horseman known as Zorro”) and the Spanish-flavored, swashbuckling scores of William Lava. And as Maltin later wrote in the foreword to A Research Guide to Film and Television Music in the United States: “It took a scholar like Jon Burlingame to know where Lava’s papers and scores resided. He not only facilitated our access to this material but provided me with vital research about the scoring of the show based on the files of the American Federation of Musicians’ local in Los Angeles. That’s how we both discovered that Walt Disney commissioned original music for all 78 episodes of the show…” Thanks, Leonard! 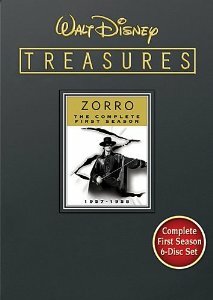 This entry was posted in Composers, Television Music and tagged George Bruns, Guy Williams, Leonard Maltin, Research Guide to Film and Television Music, William Lava, Zorro on November 3, 2009 by Jon Burlingame.